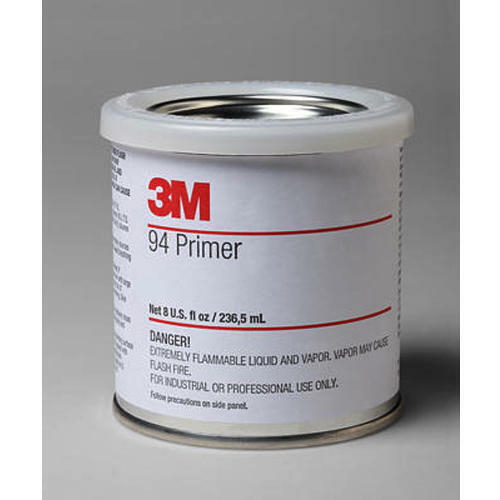 With thorough understanding of the relevant industry, we are offering a wide range of 3M Primer 94 - Adhesion Promoter. This promoter is processed by our vendor’s using premium grade chemical compound and advanced machinery at sophisticated lab in compliance with the set quality standards. Provided promoter is an alternative fastening method which offers superior aesthetic qualities over conventional mechanical fasteners and welding. It is highly demanded and appreciated by our renowned clients for its salient features. Our esteemed clients can avail this promoter from us at market leading prices. We are majorly looking inquiries from Chennai, Coimbatore, Tiruchchirapalli, Madurai, Salem, Pondycherry, Thanjavur, Vellore, all over Tamil Nadu, Andhra Pradesh, Karnata, Banglore, mysore, Hubli, Belgaum, Mangalore, Mandiya and all states in India. We, "Jaichittra Inc.", are the leading Distributor, Trader and Exporter of Lexan-Polycarbonate Sheets, Lexan-Polycarbonate Compact Sheets, Lexan-Polycarbonate Embossed Sheet and Lexan-Polycarbonate Multiwall Sheets. Established in the year 1996, we are able to offer Construction Materials, Home Construction Materials, Building Construction Materials, Door Hardware, Polycarbonate Lexan Multiwall Sheets, Sika Construction Chemicals, Silicone Sealants, Lexan Security & Glazing, Lexan Corrugated PolyCarbonate Sheets and Polycarbonate Lexan Solid Sheets. We source these products from most reputed vendors in the industry, who hold an expertise in their respective field of manufacturing. Our team of procuring agents ensures that entire procured range is manufactured utilizing high-grade raw material to make certain that it is in compliance with the international quality standards. Our exporting countries are Sri Lanka Mauritius, Thailand. These construction materials and polycarbonate sheets are extensively used in various industries such as automobile, pharmaceutical and chemical along with various commercial as well as for residential applications. Along with these products, we also hold expertise in offering continuum of after sales services that include installation, commissioning, user training, telephone & web support and repairing & maintenance of the products. We are offering these Polycarbonate Sheets & Construction Materials to some of the prominent names in the industry, such as L&T ECC, HLL, TNPL, BHEL and RBI.